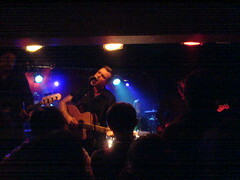 I went to see The Crimea at Fibbers on Friday night. I've been a fan of the band for several years but have never had the chance to see them live before. I was also a bit of a fan of the singer's previous band, The Crocketts. Back then, he went by the name of Davey Crockett, which is frankly a silly name unless it's your real one. The Crocketts never really hit the big time, which was a shame because they had some great songs. I think my favourite was Will you still care?, a song as radio-friendly as they come, apart from the excessive swearing in the chorus. Though the swearing was fully justified within the context of the song, (kind of an update of The Beatles' When I'm 64), it did make it hard for the song to garner much radio-play. Oh, well this was eight years ago - I should move on and get over it. But if you can track down the song, it'll be worth your while. I recommend the version from the Hello and Good Morning EP rather than the re-recorded album version. It's better. So The Crocketts got through two or three albums before disbanding. I never got to see them live, though they did play Norwich whilst I was living there. Unfortunately I was in Bristol at the time so couldn't go. I should get over that too. After disbanding, some time passed (probably. I'm guessing some of this) and Davey made a new band and started to use his proper surname of MacManus. It was a pretty good gig in the end. I really enjoyed their stage show. The singer really sells his songs and the quiet/loud dynamic really, really sends some waves over the crowd. if you can track down the song, it'll be worth your while. I recommend the version from the Hello and Good Morning EP rather than the re-recorded album version. It's better. Cheers for that - it's well worth listening to, and now you all have no excuse! I'm evil. And so is my cat. Challenge #11: EBAY - Complete! Bush returns. And is still mad.